Recreation: distraction from daily working routine during vacations. Active tourism is fun and can provide you all the pleasure you can desire. Relax your mind and recharge your body energy by practising exercise and actively participating in your entertainment. Education: An active tourist is eager to learn and wants to know closely another culture and way of living. Your vacations should broaden your horizons. Willingness to learn the language, eat the tipical food, value local traditions and respect foreign cultures and beliefs. Benefit: Tourism not only brings advantages to visitors but also helps the local economy and promotes development of the visited land. Active tourism is low impact, ecologically and socially sustainable. Active tourism uses and values nature, protects biodiversity and offers work to people. The best way to visit a land is to travel with a local friend that shows you all the beautiful and interesting attractions. Somebody that explains you about local costumes, traditions, about history, art and culture. Somebody that takes you to eat tipical food, shows you where to shop and takes you around. A friend that shows you the local nature and takes you into adventure. This is the most authentic way to visit a foreign country. Active Tourism is the contrary of passive tourism. This travelling concept is also opposed to Mass Tourism in the sense that is small scale, low-impact, run and administrated locally. 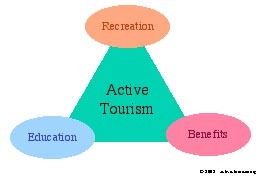 Active Tourism is socially and ecologically sustainable. Active Tourism comprises Ecotourism in the sense of protection of Biodiversity and admiration of natural beauty. But Active Tourism not only values Nature, but it also aims to educate the human being, culturally and ecologically. The participation in mental activities and physical excercises is very important for enhancing our life experiencies. An active tourist tries to educate a good mind in a healthy body. Active Tourism should not be confused with Action Tourism, which envolves many sports activities like hicking, mountain bike, cross country, bungee jumping and extreme sports. Active Tourism excludes activities and practises that are harmful to the environment and pose a threath to biodiversity and cultural structure. Many activities of Action Tourism are already offered at big scale by Mass Tourism. To guarantee protection of the environment, active tourism activities are carried out by local professional personel and under strict scientific supervision. The tour guides of Active Tourism have an academic degree in ecology, biology, ethnology, arquitecture, history or sociology. Active Tourism is not only a superficial change of image (greenwashing) but is fully committed to its principles and guidelines of operation. Some of of the most interesting activities of a region are only available to the local population. 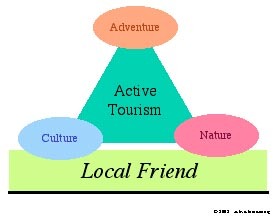 However, the international tourist can have access to them through a "local friend". Active Tourism offers this type of activities, such as dancing, cooking lessons and language learning. It also offers visits to local cultural events as football matches, concerts, theather and art expositions. Active Tourism aims also to help the sustained development of the region. 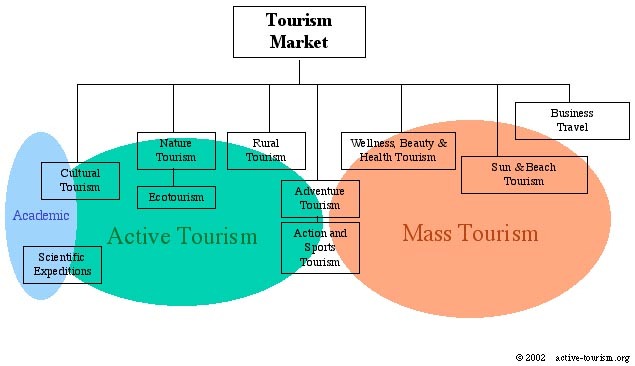 The tourist is asked to help actively and to contribute morally and economically to local social organizations and ecological iniciatives (non-profit, non governmental organizations). The tourist has not come to watch passively but to interact actively, to learn, to help and to enjoy the richness of cultural diversity. He has come to observe biodiversity, to respect and value the miracle of millions of years of natural evolution.